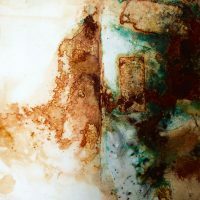 Tamsin Corrigan is a mixed media visual artist, based in Oxford. 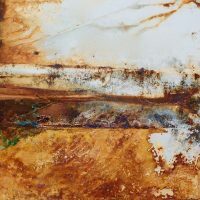 Currently working with metal oxidation and rust, Tamsin’s work uses time based chemical reactions and chance aesthetics to create contemporary visually striking glimpses of the everyday. 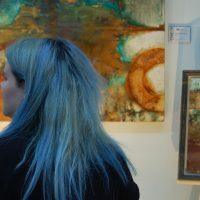 After graduating in Fine Art from Loughborough University in 2015, Tamsin has gone on to exhibit in solo and collaborative exhibitions both nationally and internationally, including London, The Netherlands and New York. Tamsin is a founder and current member of Klick, a collaborative international art collective. Facilitating events, talks, and exhibitions in Oxford and Leiden, Klick’s most recent project has resulted in a permanent art commission in Oxford City Centre. Tamsin will shortly be relocating to London to expand her art practice. “Rust is an everyday process. It is often inconvenient, cankerous, and overlooked, and happens independently of direct human interaction. 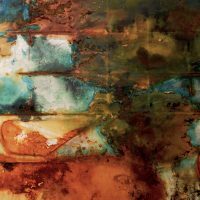 The oxidation process is autonomous and temporal, continuously evolving as a result of its environment. The damage is permanent and irreversible, culminating in the complete disintegration of the ground metal.